The Dogs of Beer – Page 51 – Home of the Delaware Beer Blog – Drinker of beer. Writer of stuff. Several years ago, my girlfriend cemented her position in my life by giving me a Brinkmann vertical smoker. I’m not sure how she knew I wanted one. Maybe it was all the times I sat transfixed in front of the TV with the Food Network on watching guys pull huge hunks of meat from smoking metal contraptions whispering, “man I’d love to try that.” Or maybe it was her deep, in-tune womanly psyche which in touch with the basic needs of her man. Nah, it was probably the whispering. 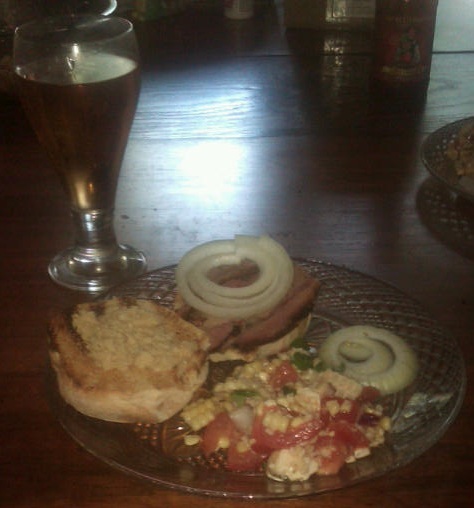 The goal (and the result) - brisket sandwich with onion and horseradish; with a tomato, corn and basil salad. Well of course I dove right in. I read everything I could on the internet. Subscribed to a couple of Enewsletters. Even bought a couple of books. Soon I was smoking chickens, sausage and pork shoulders (more on that in a later post) but the mountain I kept hearing I had to climb was brisket. Brisket is a piece of meat from the belly region, and it can not be cooked anyway but low and slow in order to break down all the fat and connective tissue. If you try to cook this like a steak, well you might as well dine on your dog’s favorite rubber chew toy. So I dove in one day and tried it, I think I did fairly well but obviously I still have things to learn. Because you have to cook it low and slow, brisket is not something you can just pop in the smoker at noon and eat at 6. So I planned to cook it by starting it early in the morning and keeping it warm in the oven until my guests arrived. Since I like to multi-task when I’m smoking I figured I’d take this opportunity to rack up some Untappd badges that I normally wouldn’t get. I normally (read rarely) drink the same beer twice in a row, and I count on one hand the number of times I buy a case of something in a year – and most of them are Guinness at St Patty’s day. So I bought a case of cheap beer (cheap beer is essential when you’re BBQing, it can be used in brines, marinades, sauces) and set the alarm clock to 2am! I had already set up my smoker so that it was ready to go when the alarm went off. The water tray was filled, and my charcoal starter was set up with a combination of briquets and lump charcoal. All I had to do when I walked out on the deck was light a match. When the coals were ready I poured them into firebox and waited for the internal temp of the smoker to hit 225. When it was ready I unwrapped the brisket and placed it in the smoker box and added some water soaked hickory chunks to my fire. Then I cracked a beer. Yeah, at 2am – I’m a professional, don’t try this at home. At 7:30 the temperature of the brisket was 135. At 140 meat doesn’t take a lot of smoke any more so I let it creep up to 145, removed it from the smoker, wrapped in aluminum foil and placed it in the oven which was set at 225 – and took a power nap. The brisket - sliced and ready to serve. When the digital thermometer read 195, I turned the oven off and left the brisket in it until it was time to serve. 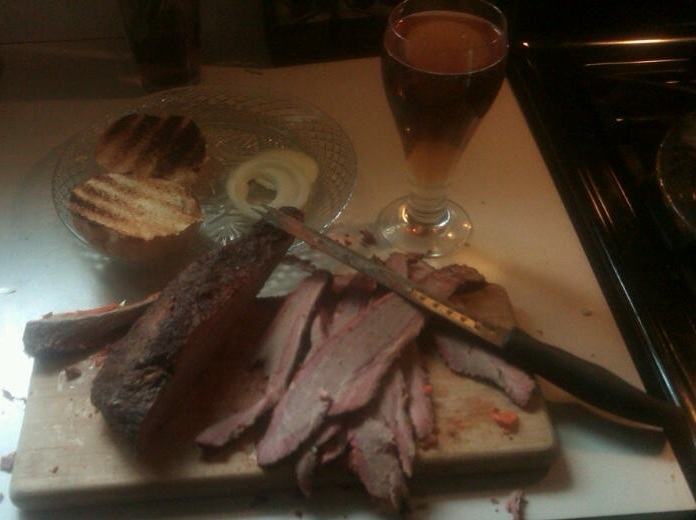 When I sliced the meat it was moist and tender, but not as moist as I’ve had at some smoke houses. The flavor was amazing and a friend of mine who does BBQ parties on the side really liked it. Unfortunately, he doesn’t have any experience with brisket so he couldn’t help with why it was a little drier that I’ve had from other places. So BBQ fanatics, what am I missing in my brisket prep? Do I need to mop on occasion? Put some liquid in when I wrap it in the foil? What’s you’re trick for making that amazingly moist brisket? Take it Easy, The Usual, Power Month, Six Pack, Drinking your Paycheck and Brewery Loyalist. I wanted the Top of the Morning (5 beers before noon), but I didn’t get it. But I did the next weekend. Time for another beer – something different. Have you ever lost a loved one? I mean a beer. A beer you loved? A beer you told all your friends about? A beer you’d take home to your mother? And then one day, it’s gone. You read it in a newspaper or got a tweet from a friend. Gone. Never to be seen again. The reasons why beers disappear are varied. Sometimes the breweries just aren’t that good. Sometimes it’s location. Sometimes it’s business. But whatever the reason, breweries and brewpubs close down. And every now and then, a great beer goes down with them. Such is the case (in my opinion) with Heavyweight Brewery’s Perkuno’s Hammer Imperial Porter. Heavyweight, in Ocean Township NJ, closed in 2006 and sadly took this awesome beer (and many of the other great beers they brewed) with it. But sometimes, good people won’t let good beers die. Cue the people from Victory Brewing. After realizing that Hammer’s disappearance from the shelves left a huge empty hole that needed to be filled they put their heads together with Tom Baker (Heavyweight Owner/Brewer – he was last seen here) and Lew Bryson (well known Author of Mid-Atlantic breweries) and came up with their own tribute to the style – Baltic Thunder in 2008. *SNIFF* Heavyweight's long gone beer. 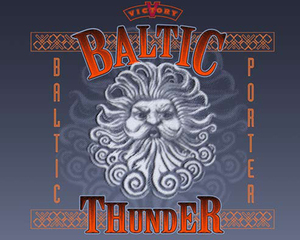 Them : Baltic (Imperial) porters are similiar to IPA’s in that they were born due to a need for beer to survive being shipped a great distance. Introduced to the Russian’s, the dark beer was brewed with a higher level of alcohol to survive the trip. The grain bill for Baltic consists of imported German 2 row and roasted malts. An interesting addition to the grain bill is black-eyed peas which substitutes for the Roman Beans (Tom’s research showed they were a traditional ingredient in the style) found in the original beer. The beer clocks in at 8.5% ABV and can usually be found in 22oz bottles and on rare occasions draft. Me : Baltic Thunder pours with a small head the dissipates into a thin ring that circles the entire edge of the glass. The color is black from top to bottom – no light getting through this baby. The nose has tones of malt, mocha and chocolate. Some people I know would probably dial coffee in there as well – it all depends on what your palette reference is built from. In the mouth Baltic Thunder continues along the same theme. It starts in the front with a malty (dare I say sweetness – perhaps molasses) that finishes in the back with a dry roastiness. And then all that lingers in the after taste, along with slight stickiness. Thanks Victory for saving one of my favorite beers. Now if you could bring back Mystery Science Theater 3000, that would be awesome! What beer have you lost that you wish someone would bring back? There’s an old saying that “Too many cooks spoil the soup”, but if you look around the brewing industry that doesn’t seem to be deterring to many of the “cooks” out there. Collaboration brews are running wild. Dogfish Head and Sierra Nevada had their Life and Limb/Limb and Life beers. Dogfish Head also teamed up with Three Floyds on Poppa Skull. And if you think two brewers aren’t “too many” – Stone Brewing has kicked it up. Their collaboration series of beers are always the product of three different brewers. They’ve worked with the likes of Dogfish Head, Victory, 21st Amendment, Maui Brewing, Brew Dog from Scotland and Mikkeller from Denmark. You can check out their impressive list of collaboration beers here. For this review I’m going to look at a pairing of cooks in my nearby area, Flying Dog Brewing from Frederick, MD and The Brewer’s Art from Baltimore, MD. Their soup? Table for Two. Table for Two is listed as a Belgian table beer. Table beers are typically low alcohol (1% ABV is not uncommon) that were traditionally enjoyed by adults and children at meal time. You can find the Brewer’s Association description of a Belgian table beer on page 19 of this PDF. Them : The grain bill for this beer consists of French Pilsner, cara-vienna, and biscuit malts along with some rye added in. The hops used are brewers gold and styrian goldings. Wildflower honey rounds out the beer. The beer clocks in at 5.0% ABV which is a little more than a traditional table beer, but since we don’t let our children drink beer I’m good with it. Me : My bottles of Table for Two seemed lightly carbonated, the head is a thin lace of bubbles which seems to suit this style of beer. In the tasting glass the color starts as a light golden and goes up to a light copper. The flavor starts up front with a malty/honey sweetness that turns into a spiciness (that I get as a light clove) in the middle. The finish is a quick crispness that soon leaves my mouth watering a bit. 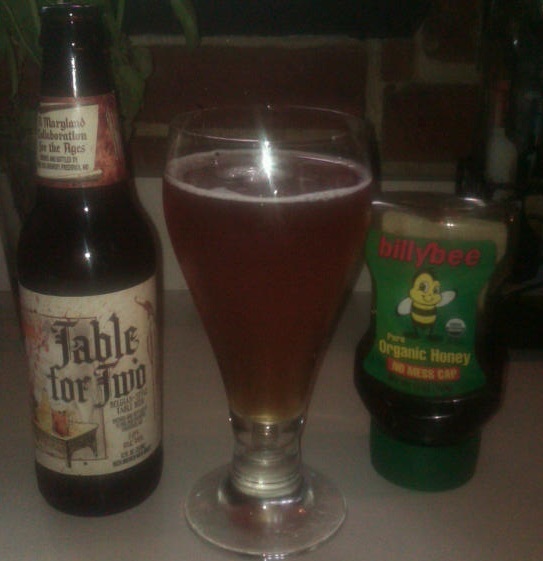 The honey is subtle throughout, a nice component that gives whole beer a nice balance. This beer is very drinkable and, as its style suggests, could complement a wide array of dishes that might find their way to your meal time table. To many cooks? Not from where I’m sitting. So next time you’re out with some friends sitting at a table for six, order some Table for Two. People enjoying great beer is something there can never be to many of. What’s your favorite collaboration beer? Last night I had the pleasure of hanging out with some friends (along with the co-founder of tDoB, Chuck!) at Two Stones Pub in Newark, Delaware for what has become a Wednesday night tradition. The place was packed (nice business for a Wed) and the beer choices were excellent as usual. But that’s not what brought us in – it was Randall. Now Randall isn’t the cook, the beer buyer or the pretty bartender with the sweet smile (but if she was that would be funny), no randall is a little contraption dreamt up by the boys at Dogfish Head. This little device allows you to infuse any beer from your tap system with anything you want. And I do mean anything. If you can get it into the first chamber it’s fair game! From what I have read and heard the unit started from humble enough beginnings as a way to put an extra hop kick into a beer as it was being poured into the glass. But beer drinkers being the creative bunch that they are, it wasn’t long before other things began to sneak their way into it. The system itself seems simple enough (although since you’re dealing with liquid under pressure I’m sure it’s not), the first chamber holds what ever you wish to infuse into your beer while the second chamber gives the infused beer time to settle to reduce foaming when poured. A cylinder around the second chamber allows ice to be added to keep the beer in it chilled until it is dispensed. And there’s a filter between to the two chambers – no floaties please! I watched the bartender from my envious vantage point of “right in front of it” pour several glasses throughout the night and I can tell you that those baristas who make your coffee in the morning had nothing on this guy. He was working the system like a champ and the rewards were excellent. Last night was Dogfish Head’s Theobroma (a beer brewed with Aztec cocoa powder and nibs, honey, chilies and annatto) over strawberries, shaved chocolate and vanilla beans creating what Two Stones called “a napoleon” after the popular ice cream trio. The shaved chocolate really popped the already chocolate tones in the Theobroma and the vanilla seemed to pull everything together. The strawberries were subtle but there, possibly over powered a bit by the already big brew. One of the interesting things about the randall is, depending on what you put into it and how well or how quickly it infuses into the beer – the beer can change throughout the night. The beer you get at 9pm might be completely different from the one you had at 7. Or if your timing is right, order the beer before it is installed and then save it (tough, I know) to compare with the beer coming out of the randall. Victory Brewing Old Horizontal over brandied figs and dates. Dogfish Head Festina Peche over local peaches and (yes, no kidding) Sour Patch Kids. Victory Brewing Golden Monkey over bananas and walnuts. As you can see you’re only limited by the beer you have on tap, and your own imagination. So next time you’re on a pub run, keep an eye out for my buddy randall hanging out around the bar. And if he’s there forget all that nonsense the commercials used to try and tell you about “not fruiting your beer” and give him a try. Maybe if you’re lucky after a few beers he’ll tell you how he got his nickname “the enamel animal”. Oh, and tell him I’ll see him next Wednesday will you? Thanks. 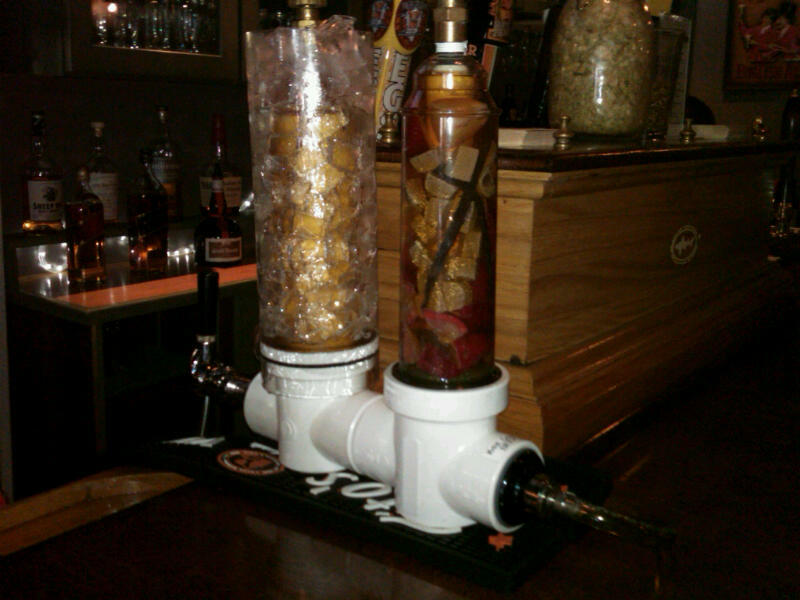 Have you had a beer through a randall before? And if so, what’s your favorite beer/randall combination? So it’s a beautiful summer day and you find yourself on the boardwalk at Coney Island. The smell of the water lingers lazily across the beach being broken every now and then by the alluring aroma from a near by venue of a Nathan’s hot dog cooking. And if you’re going to eat a Coney Island hot dog, what would be better than a Coney Island beer to go with it? The Shmaltz Brewing Co (He’Brew) has you covered. Their Coney Island series pays homage to its well know freak show attraction, each beer being named after a noted performer in the show. 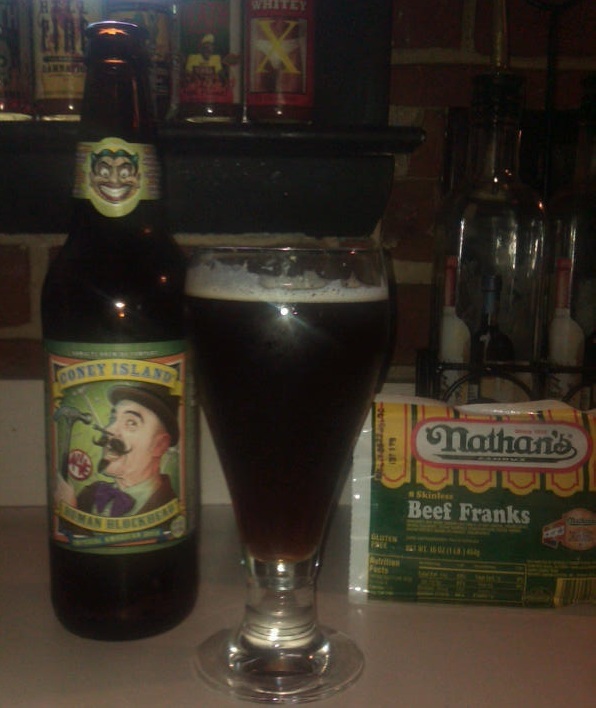 In this review I taste their Human Blockhead Imperial American Bock. Them : Their Human Blockhead is not a simple beer. The grain bill consists of specialty 2-Row, Munich, Vienna, Pale Crystal and Crystal malts. Also added to the mash are wheat, rye, rye ale and flaked oaks. This is a well constructed beer. The hops are not skimpy either. Added to the kettle are Warrior, Tettenang, Crystal, Liberty and Cascade. At 10% ABV it’s probably a little too strong for a ballpark beer. It was awarded Grand Champion Alternative Lager at the World Beer Championship. Me : Human Blockhead pours with a medium head that reduces down to a fine, glass clinging lace. In my tasting glass the color graduates from a light copper to a dark, almost brownish hue. The noise contains a nice combination of deep malt with some twinges of caramel. In the mouth, the beers starts malty in the front and transitions into a crisp bitter finish in the back. The aftertaste is a slight lingering malt. All this balances the 10.0% alcohol pretty well. It has all the malt backbone for a Bock (minus the -ator suffix that most Bock beers get) and the hops and alcohol to earn it’s Imperial name (which I’ll address in an up coming post). An awesome aspect of the Coney Island brands is the fact that proceeds from them help Coney Island USA(TM), a none profit organization dedicated to helping keep Coney Island, well, Coney Island. A Nathan’s dog with onions, a Coney Island beer AND I get to help a cause? I’ll sign up for that any day. Have you tried any of the Coney Island beers? What did you think of them? Let’s be honest, drinking is a social event. Oh I won’t lie, I enjoy drinking a nice beer in quiet solitude (well as much solitude as you can have with a girlfriend, two kids and two dogs) but if you look through history, drinking has been an activity that brings people together. Whether it’s a bottle of wine at dinner, some mead shared by vikings around the campfire, or guys at the local bar cheering on their favorite baseball team. Whatever the occasion, people enjoy drinking together. So it’s no small wonder in this age of social media that a few people have taken up the task to broaden the scope of social drinking, and to my thinking it was inevitable. One such group are the guys from Untappd, the designers of a social media application that allows you to enjoy beers with your friends, even if they’re seven states away. The concept is easy enough (if you do Facebook or Twitter you’re 3/4 of the way there) and in my mind the execution is flawless. To start, point the browser of you computer to the Untappd website. I always recommend registering and setting up new accounts on a computer – it just seems easier. Once you’ve answered a few easy questions and roamed around the site you’re ready to go. Now here comes the easy part, go drink a beer. See? Fun isn’t it? While you’re sipping, point the browser on you phone to return to the Untappd web application. Yes, I hear you “what? no app?” No, at the moment Untapped runs off of a web browser based app so you’ll need a phone with internet capability to get the most at out it, but don’t panic! The app is tight and straight forward and you’ll have no problems running it. Once you’ve logged onto the Untappd web app, the fun begins. By clicking a button at the upper right of the screen that says “drink up” you’ll be taken to the check in screen. Checking in is easy. First, in the field for your beer, type the name or a few key words of your beer and hit the search button. 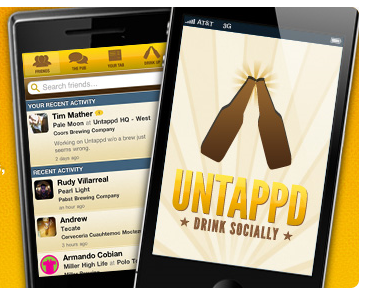 Untappd will then search through it’s extensive beer database and find the beer it thinks you’re drinking. Didn’t find it? Don’t worry, Untappd gives you the ability to add it – but to be honest, I think you’ll rarely have to do this. Once you’ve entered your beer next is the location where you are enjoying it. Untappd gives you the ability (you can opt not to do this if you wish) to use your phone’s built in GPS to find your location and give you options in the surrounding area as to where you might be enjoying your beer. Again, not there? Add it! It’s easy. After location you have the ability to leave a comment. Untappd gives you plenty of space to do this. If you don’t leave a comment your check in will have some little notation like : TheDogsOfBeer are sipping a Summer Love from @Victorybeers at @2stonespub. However, bear in mind that if you do add a comment, that comment will be displayed in your Twitter feed (more below) and since you have only so many letters on Twitter, the above message will be displayed as a link back to Untappd. So if you want to comment make sure you include the name of your beer (at the very least) and the location so people can easily see them. Now that the basics are in the next part is one of my favorite things about this app. You can connect your Facebook and Twitter accounts to Untappd so that your activity is uploaded from Untappd (do this when you register) when you check in. However every time you check in, Untappd gives you the option of whether or not you want to upload your activity to these accounts. A few clicks on some radio buttons and you’re all set. Now is the big moment. Click the “Confirm Your Brew” button and POW! you’ve checked in your first beer. One of the coolest things about Untappd is that it rewards you for your beers in the way of badges. Badges can be earned based on the beers you enter, and there are some cool ones. Badges are separated into three categories, the first, BEERS is pretty straight forward. You get badges at certain numbers of unique beers (1, 25, 50…500) you check in. You can also get badges for drinking beers in a certain style like mexican, IPAs or irish. Drink 5 beers in a sitting and earn your “Drinking Your Paycheck” badge. The next catagory is venue. Interesting badges like Ahoy Matey!, The Layover, Hitting The Slopes and Bowl-a-Rama wait for you beer lovers that tend to enjoy your brews in interesting places. Finally, the really cool ones, the “Special” badges. Some of these are limited to within a certain time frame. For instance, you needed to check in during American Craft Beer Week to earn that badge. Now you’ll have to wait till next year. Some of the badges however are a collaboration between Untappd and other beer minded people. Dogfish Head Brewery has a badge for anyone that drinks three beers in their Ancient Ales category. The guys from Hop Cast have just jumped on, drinking beers that they feature on their webcast show will get you a badge. And don’t over look one of my favorites, “New Beer Thursday”. Check in with a new beer three Thursdays in a row and get your badge. Got it? Well keep going! The badge has levels. There are other apps out there for connecting to your beer friends. I encourage you to seek them out, find one that works for you and start checking in. After all, drinking is a social event. And it no longer matters if the person you’re drinking with is 4 time zones away! Time for a beer, I want that July 4th badge! What’s your favorite app for beer? Have you used Untappd? How do you like it? I know “Who Let the Dogs” out…. My buddy Chuck and I did. About 10 years ago. It all started when Chuck, a first class beer geek and NYC pub runner met me, a first class beer geek and NYC pub runner. After several beer trips together in NYC, Baltimore, Chicago and other parts unknown, we got cocky and on one drunken outing we dubbed ourselves “The Dogs of Beer” for some stupid reason that is probably best forgotten, and thanks to the beer probably is. When I went on Twitter I signed up as TheDogsOfBeer knowing full well I was really only getting on Twitter so that I could check in with the Untappd app. In hindsight I wish I had picked IAmEdsLiver, but it’s to late to turn back now. Anyway, I’ve done so much beer stuff that I thought I’d try my hand at blogging about it. If nothing else it will serve as a record for myself about the travels and beers I’ve had. The memory isn’t what it once was. It’s the age – not the beer. Ok the beer helps. Realistically, I probably should have started years ago. Hopefully I’ll have as much interesting things to discuss going forward as I’ve done in the past. As for what readers will find here. I’m hoping to do reports of beer happenings in my surrounding area (Northern Delaware, USA – tristate area), regular beer reviews and creatively embellished stories of past exploits. But what’s beer without life, or life without beer? So you’ll see other stuff as well. Cooking, grilling, music, all is fair game. Author Ed (The Dogs of Beer)Posted on June 30, 2011 Categories GeneralLeave a comment on I know “Who Let the Dogs” out….